published widely in the areas of whole language, miscue analysis, and the politics of literacy authoring over 25 books and 300 articles. Their newest publications are Making Sense of Making Sense (in press, Routledge), Whose Knowledge Counts in Government Literacy Policies? Why Expertise Matters (2013), and Reading in Asian Languages: Making Sense of Written Texts in Chinese, Japanese, and Korean. Making Sense is one in a series of books in which international scholars themselves compile career-long collections of what they judge to be their finest pieces – extracts from books, key articles, salient research findings, major theoretical and/practical contributions–and which present themes and strands of their work, their contribution to the development of a field, as well as the development of the field itself. In Whose Knowledge Counts in Government Literacy Policies, the Goodmans address accountability, in the form of standardized test scores, and how it is built into many government literacy policies, with severe consequences for schools and districts that fail to meet ever-increasing performance levels. The key question this book addresses is whose knowledge is considered in framing government literacy policies? The intent is to raise awareness of the degree to which expertise is being ignored on a worldwide level and pseudo-science is becoming the basis for literacy policies and laws. The authors, many members of Reading Hall of Fame and leading researchers from the U.S., U.K., Scotland, France, and Germany share in common concern about the lack of respect for knowledge among policy makers. Collectively the articles offer a critical analysis of the condition of literacy education past and present and suggest alternative courses of action for the future. Reading in Asian Languages, coauthored with Shaomei Wang and Mieko Ivantosch (2012, Routledge), is a collection of articles written by researchers and teacher educators about the relationship between reading in Asian languages and Ken’s reading model. Their most recent publication, Making Sense of Making Sense is a selected collection of their writings which is a part of a World Library of Educationalists (Book Series) by Routledge. The authors, all leading researchers from the U.S., U.K., Scotland, France, and Germany, have a wide range of views but share in common a deep concern about the lack of respect for knowledge among policy makers. Each author comes to the common subject of this volume from the vantage point of his or her major interests, ranging from an exposition of what should be the best knowledge utilized in an aspect of literacy education policy, to how political decisions are impacting literacy policy, to laying out the history of events in their own country. Collectively they offer a critical analysis of the condition of literacy education past and present and suggest alternative courses of action for the future. The Goodmans’ web seminar will address three questions: How do people make sense of text? How do people learn to read? and What do teachers need to know about how reading works and how it is learned to be successful? Their web seminar will present research informed by their collaborative research across the decades. 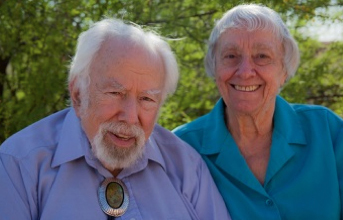 Access Dr. Ken and Yetta Goodman’s website. Read Dr. Ken Goodman’s blog. Watch two short videos as Dr. Yetta and Ken Goodman discuss public schooling and standards. Dr. Ken Goodman received his A.B and Ed.D. from UCLA and a M.A. from California State in Los Angeles. Over the years, he has taught in elementary schools as well as secondary schools. His most noted recognition is his development and implementation of whole language, a theory and method of teaching and learning reading that influenced, and continues to influence, classrooms worldwide. He has served on the many commission for NCTE. He served as President of NCTE. Also, he has served as President for the National Conference on Research in English, Center of Expansion of Language and Thinking, International Reading Association and Whole Language Umbrella. Dr. Goodman has received many honors over his distinguished career such as NCTE’s David H. Russell Award for Outstanding Research in English, IRA’s William S. Gray Citation of Merit, LRA’s Oscar S. Causey Award for distinguished research, NCTE’s Outstanding Educator in the Language Arts, and the National Council on Research in Language and Literacy Distinguished Researcher Award. He was elected to the Reading Hall of Fame in 1991. 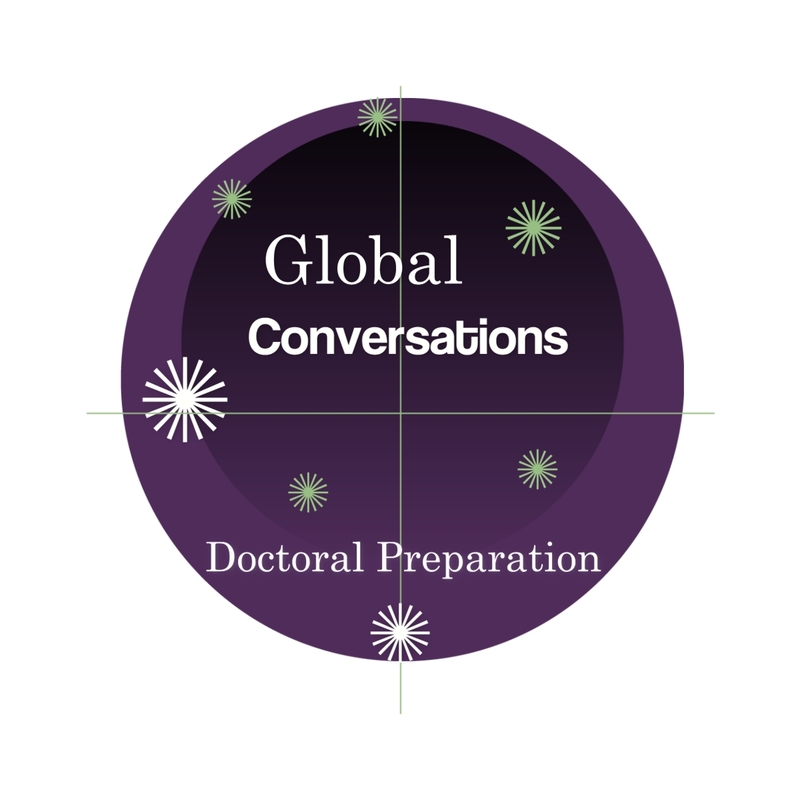 Dr. Yetta M. Goodman consults with education departments and speaks at conferences throughout the United States and in many nations of the world regarding issues of language, teaching and learning with implications for language arts curricula. In addition to her research in early literacy, miscue analysis and in exploring reading and writing processes, she has popularized the term kid-watching encouraging teachers to be professional observers of the language and learning development of their students. She is a major spokesperson for whole language and in her extensive writing shows concern for educational issues and research with a focus on classrooms, students and teachers. She received a B.A. in History. M.A. in Elementary Education from Los Angeles State College and her Ed.D. in Curriculum Development from Wayne State University, Detroit. 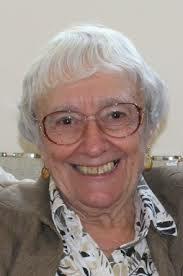 She is currently a board member of the International Center For the Study of Literacy Processes. She has served has President for NCTE and was on the board of IRA. Dr. Goodman has received many honors over her distinguished career such as IRA and Merrill Publishing Company’s Outstanding Teacher Educator in Reading Award, University of Arizona Faculty Achievement Award, Frobisher Teacher Education Award awarded by TAEYC, NCTE Distinguished Service Award, and NCTE Outstanding Educator in Language Arts. She was elected to the Reading Hall of Fame in 1994. Goodman, K.S., Calfee, R.C., & Goodman, Y.M. (2013). 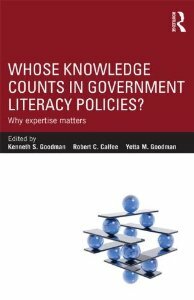 Whose knowledge counts in government literacy policies? : Why expertise matters. New York, NY: Routledge. Goodman, K. S. (2012). Reading in Asian languages: Making sense of written texts in Chinese, Japanese, and Korean. New York, NY: Routledge. Flurkey, A. D., Paulson, E. J., & Goodman, K. S. (2008). Scientific realism in studies of reading. New York: Lawrence Erlbaum Associates. Goodman, K. S. (2006). 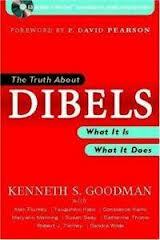 The truth about DIBELS: What it is, what it does. Portsmouth, NH: Heinemann. Goodman, K. S. (2004). Saving our schools: The case for public education: Saying no to “No child left behind”. Berkeley, Calif.: RDR Books. Goodman, K. S., Flurkey, A. D., & Xu, J. (2003). On the revolution of reading: The selected writings of Kenneth S. Goodman. Portsmouth, NH: Heinemann. Goodman, K. S. (1982). 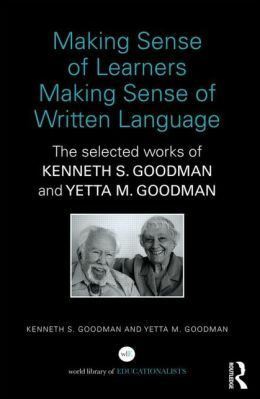 Language and literacy: The selected writings of Kenneth S. Goodman. Boston, MA: Routledge & Kegan Paul. Goodman, K. S. (1996). On reading. Portsmouth, NH: Heinemann. Goodman, K.S. (1993). Phonic phacts. Portsmouth, NH: Heinemann. Brown, J., Goodman, K. S., & Marek, A. M. (1996). Studies in miscue analysis: An annotated bibliography. Newark, Del. : International Reading Association. Goodman, K. S., Goodman, Y. M., Flores, B., Reading in the bilingual classroom: Literacy and biliteracy. Rosslyn, Va.: National Clearinghouse for Bilingual Education. Goodman, K. S., & Wayne State University. (1968). The psycholinguistic nature of the reading process. Detroit, MI: Wayne State University Press. Goodman. New York, NY: Routledge. Hoffman, J. V., & Goodman, Y. M. (2009). Changing literacies for changing times: An historical perspective on the future of reading research, public policy, and classroom practices. New York: Routledge. Goodman, Y. M., & Martens, P. (2007). Critical issues in early literacy: Research and pedagogy. Mahwah, NJ: Lawrence Erlbaum Associates. Goodman, Y. M., Watson, D.J., Burke, C. L. (2005). 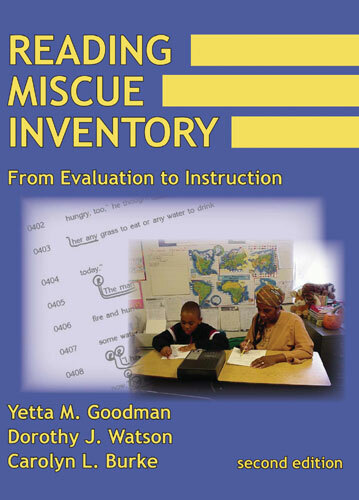 Reading miscue inventory: From evaluation to instruction. Richard C. Owens. Owocki, G., & Goodman, Y. M. (2002). Kidwatching: Documenting children’s literacy development. Portsmouth, NH: Heinemann. Bird, L. B., Goodman, Y. M., & Goodman, K. S. (1991). The Whole language catalog. Santa Rosa, CA: American School Publishers. 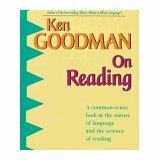 Goodman, Y. M., International Reading Association., & World Congress on Reading (11th : 1986. How children construct literacy: Piagetian perspectives. Newark, Del. : International Reading Association. Goodman, Y. M., Burke, C. L., & Sherman, B. (1980). Reading strategies: Focus on comprehension. New York: Holt, Rinehart, and Winston.